What should a horse owner know and do to recognize and prevent foot/hoof abscesses? 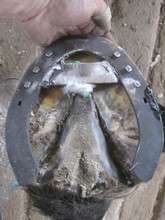 Evaluating a horse's hoof before treatment. 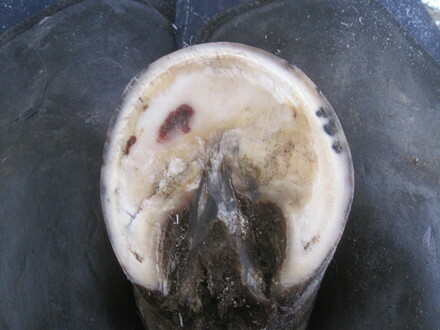 Hoof abscesses are probably the most common cause of acute lameness in horses.These pockets filled with pus become very painful as the abscess presses against surrounding tissue, bone, or the hoof wall. If the abscess is not treated, it may break, causing infection in the surrounding tissue. Abscesses can be caused by a puncture from any variety of sharp objects â nails, staples, or rocks. They can result from alternating climate - wet weather causes the feet to soften, allowing bacteria to enter the sensitive structures through the white line; the return of dry climate causes the hoof to harden and the bacteria are trapped.The gas produced by the bacteria causes pressure and pain between the insensitive and sensitive area. A horse with an abscess will have heat in the foot, a throbbing pulse and swelling around the coronary band. Other causes include a bruise or corn, cracks in the hoof wall, and laminitis. Abscesses are a common sequel (result) to laminitis since the sensitive structures are damaged, die and become necrotic (gangrene or rotten). A horse with an abscess will have heat in the foot, a throbbing pulse and swelling around the coronary band. The horse might even be 3-legged lame and have a difficult time getting around. Horses may respond differently with one or more of the signs listed. Abscesses may develop even with the best of care. Some horses have re-occurring abscesses that can be frustrating to all involved. These abscesses may be due to blood born bacteria, the weak integrity of a hoof due to genetics, or as a result of a past injury or trauma. 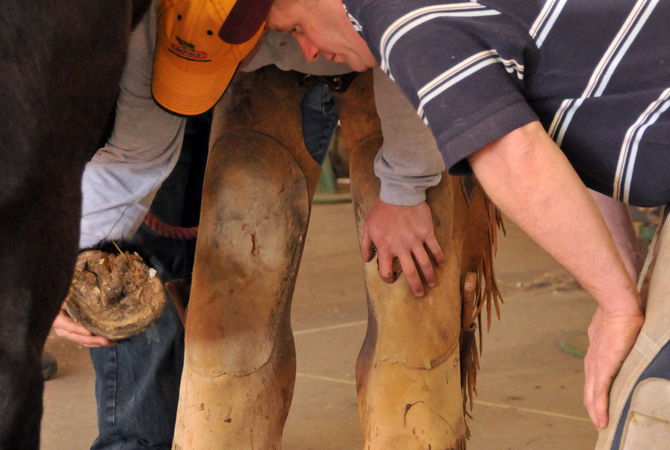 Farriers can help by monitoring the feet during regular routine appointments for trimming/shoeing. 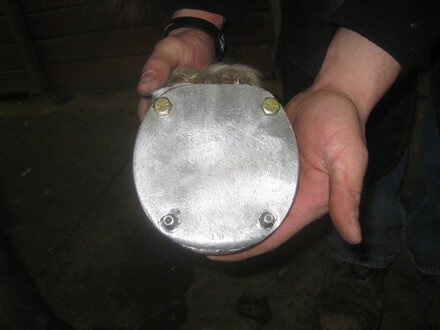 The hooves are kept a healthy length preventing extra strain by excess length. Horse owners can help by picking the horseâs feet on a regular basis, and by being on the lookout for anything abnormal including penetrating objects. If there are any concerns, the farrier or veterinarian should be contacted. Management of where horses are stabled including keeping the area clean is helpful in preventing injury that may cause abscesses. Good stable/barn management can prevent other common foot problems besides abscesses. If you suspect an abscess due to the symptoms or signs mentioned earlier, soak the foot an Epsom salt solution. Fill a rubber feed pan, with warm water to where it reaches the top of the hoof (not so hot that you canât put your hand in it). Once the foot is in the feed pan, pick up the opposite foot, so the horse will put his weight on the affected limb and stay in the pan. As the heat leaves the water the horse wonât have as much desire to keep its foot in the pan. This helps draw out the abscess and will only make the horse feel better. It might require soaking the foot at least once a day for several days. On one occasion, an abscess took more than 2 weeks to surface. In my experience that is not the norm â usually they will break in a few days. A hospital pad/plate can be attached to the ground surface of a horseshoe by bolts. Epsom salt poultice wraps are also available. These work well when you want to apply a drawing agent for an extended period of time. You wonât have to argue to keep the horseâs foot in the feed pan. Some abscesses donât break right away. For these you will need a veterinarian to dig a small hole to locate the abscess. Avoid digging large holes in the sole. Exuberant granulation tissue can form. This can create more of a problem than what the abscess was. A full pad can be put between the horseshoe and hoof to protect the abscessed area. However, it is difficult to continue to medicate an affected area with this option. Another possible treatment for an abscess that is still painful is a cross bar. A hospital pad/plate can be attached to the ground surface of a horseshoe by bolts. This allows the plate to be removed for regular treatment of the affected area. The plate is then replaced after the foot is medicated. Another possible treatment for an abscess that is still painful is a cross bar. After a horseshoe is shaped to the horseâs foot, a small, flat piece of bar stock can be welded to the shoe to protect the sore area. Your farrier provides the knowledge and expertise for keeping your horse's hoofs trimmed, shoed, healthy and sound, and giving advice on improvement in diet for horses with hoof problems. Some abscesses are very near the surface of the hoof, causing extreme pain. I once had a horse that walked in 3-legged lame. As I picked out the hoof and began to pare some sole out with my hoof knife, I made one pass in the seat of corn area and pus shot out. The pus was grayish in color and had a foul smell. The horse let out a big sigh. When I let the foot down, he immediately put weight on it. After I finished trimming the horse, and cleaned the affected area with peroxide, he walked out sound since he didnât have the pressure of the abscess anymore. When dealing with abscesses this doesnât always happen. We have to be careful that when we are asked to dig for an abscess that we arenât looking for this result. Especially if weâre not sure the location of the abscess and how close it is to the surface. Several years ago we had a neighbor who called and asked us to look at their lame horse. They really werenât quite sure what was wrong with the horse. An inexperienced substitute veterinarian had been there and concluded the horse had foundered and needed to have the Deep Flexor Tendon cut as part of the treatment. There was heat in one foot and a throbbing pulse compared to the contra lateral foot. Through use of the hoof testers we were able to identify a sorer area in the foot. The owner soaked the foot for a few days in Epsom salts and the abscess burst allowing the horse to return to normal use within a short time. Then she revealed that the horse had abscessed before. This hadnât even crossed her mind since she was guided in a different direction. How horrible it could have been if they cut the Deep Flexor Tendon and then discovered it was an abscess? Sometimes we might overlook something or jump to a conclusion. It helps to get a fresh perspective and consider all of the possibilities. Abscesses are common, especially in the spring, but can be treated. Once they open and drain, the horse will recover quickly. Be aware of abscess signs and potential foot problems and seek professional advice from your veterinarian and farrier. Jacob is a Certified Journeyman Farrier with the American Farriers Association. He coauthored the third edition of The Principles of Horseshoeing (P3). For four years Jacob taught at Mesalands Community College, where he had the opportunity to teach the semester certificate courses, as well as the 2-year Associate degree courses. He is an Associate of the Worshipful Company of Farriers. 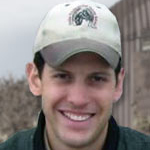 He is the Director and an Instructor at Butler Professional Farrier School LLC in Crawford, NE.